Broken Bonds- My children haven't seen each other or me since I was locked up. Broken Bonds- My children haven’t seen each other or me since I was locked up. I’m locked up on an assault charge. I got seven flat. My boys were 9 and 10 and my daughter was 6 when I got arrested. I can’t say much about my case, but what led me here is that I was in a very abusive relationship with my kids’ father. He began using drugs and became physically abusive toward the kids and me. I wish that I’d spoken up more about the abuse I was experiencing, but I was scared. He made so many threats that I feared even breathing the wrong way. I didn’t want to involve anyone else in my problems. I felt that if I ran to someone for help, he would have hurt the person who tried to help me, too. If he caught me just talking to someone, he would make a scene. I also didn’t know who I could turn to. I had no ties to New York at all, so I felt very lonely. I wished I’d never left home. Looking back, I see that I wasn’t really thinking clearly at all. I just felt scared, anxious and helpless. I got stuck and I really couldn’t react to the abuse. I wish I’d spoken up more instead of trying to hide what I was going through. If I had spoken the truth or showed the marks on my body, maybe I wouldn’t be sitting in prison for the next few years of my life, facing a lifetime of fighting for my kids. At my worst moments, I told myself, “The one thing in my life that I do have and no one can take from me is my children.” Boy, was I wrong! The day I was arrested, my kids were taken from me before I even knew I was under arrest. I lost the biggest part of my life. Now that I’m in prison, the court controls the contact I can have with my children. I had to agree to certain terms. I’m not allowed to visit my children or talk to them on the phone. I can only contact them through letters. When I was finally granted one visit with my kids, I was not allowed to speak to them about my arrest. I wonder what my kids know about my crime and our separation, and if they understand why they can’t visit and why I never said goodbye. Once when I met with the DA, he told me that I abandoned my children by coming to jail. I know that he meant that you can no longer care for your child when you’re locked up. You can’t provide food, shelter, clothing, or care for your child emotionally. But the word “abandoned” hit me hard. It kept ringing in my head. I broke down when I got back to my cell. I know I made real bad choices, and one of the ways I have to pay for my bad choices is by having minimal contact with my children. But I never meant to hurt my children. Even though I did hurt them by committing my crime, being separated from my kids was the last thing I ever wanted. I often think back to that visit, the last time I saw the beautiful faces of my children. The officers brought me into a long conference room and took my handcuffs and shackles off. My 9 year-old-son came in first. He was still short and skinny with dark brown hair and glasses. When he saw me he put a big smile on his face. Right behind him came my 10-year-old son. His hair was growing in and he was still chubby. Finally, my baby girl, just 6, came up to me and I hugged her, looking into her eyes. I noticed that her hair was cut short. She has dark brown hair with lots of curls. With her curls were sitting on top of her head, she looked like the girl from Curly Sue. My first instinct was to cry and tell them I loved them and that I was sorry. But I was told that crying wasn’t allowed and neither was saying sorry. So I held back my tears. I hugged and kissed them and told them I loved them. My kids had just come in from playing outside. They had ice cream on their shirts. So we just sat and talked about their ice cream and how their summer was going so far. That was a very good day for me. 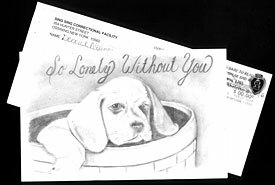 It’s an everyday mental struggle to sit here at Bedford Hills Correctional Facility, not knowing when I will get to see my children next. I wish daily that I could see or at least speak to my children. I would like to say sorry and hear how they feel. I write to my children but I’m not sure how they are doing because I can’t speak to them and it’s hard to get them to write back to me. They’re so young. I hear about my kids through my mom. I’m really grateful for her. She tells me that my children do miss me and would like to see me and each other. My kids have been living with different family members since I was locked up. After months of going to family court, we agreed on a plan for the kids to see each other on weekends, rotating families. I thought it was a good plan. Even if they could not see me, they could see each other. But after four months, I learned that their legal guardians haven’t made the effort to keep up contact as we agreed. I can only imagine how hard it’s been for my kids that they haven’t been able to see each other. My kids always did everything together: played, argued, told on each other and shared secrets. My kids had a beautiful relationship, and I really wish they could have that back. When I found out my children were not getting visits, I was determined to help them. I wrote to the social worker who handled my case but never got a response. Finally, my advocate here at Bedford Hills contacted the child welfare system and I got some information. It turns out that the visiting agreement that was made in court was just a suggestion, not a requirement. The family court can’t or won’t do anything about it. The child welfare system also said it can’t help me; my case is closed since none of my kids are in foster care. I was so hurt and angry when I learned the truth. I felt like, when they sent me to prison, they thought I was going to forget about my kids, and that the court made false promises just so that I would feel OK. The reality is I’ll never be OK until my kids are visiting each other, I know they’re safe, and I’m with them again. Once again, I feel helpless, stuck in a situation I can’t change. I have petitioned the family court to see if the court can make a different arrangement that requires that my kids see each other. I’m also hoping that the judge will grant me more than mail contact with my children. When I go to court this time, I will ask the judge and the social worker to explain everything to me in detail and in terms that I can understand. I don’t plan to just settle for anything this time. I believe the system is made to break you. They do a good job of making a person feel like the she’s nothing. They want to see when you’ll give up. But I will do my best not to let them see me hurt and to help my kids get consistent visits and contact with me.